An Iraqi official has accused “racist” Kurds of trying to establish a second Israel that will throw the region into years of conflict. “The step that was taken by some racists in Kurdistan will bring instability to the entire region for years to come. The representatives of such efforts had established the state of Israel in 1948,” Mowaffak al-Rubaie, an MP from the ruling Shiite National Alliance told reporters in the Iraqi parliament. There have been three wars since the creation of Israel, he added. Rubaie is a former National Security Adviser. “The one who loses the most is our beloved Kurdish nation,” he continued. On Monday, the Iraqi parliament requested Prime Minister Haider al-Abadi to deploy troops to the areas that have come under Peshmerga control since the US-led invasion of Iraq in 2003, the latest in a series of measures announced by Abadi. On Sunday, he called on foreign nations to close their air and land borders with the Kurdistan Region. Rubaie warned that all the achievements made by Kurds in Iraq since 2003 are now under threat. 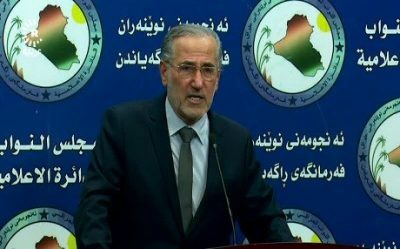 “The government should take decisive, forceful, strong, and practical steps against those who made adventures with the destiny of the people of Kurdistan,” the Iraqi MP said, adding that Iraq should make use of “soft power” for now against the Kurdish leadership. While he said that it is “unacceptable” to use military force against the Kurdistan Region, “security” options are not off the table. “The sanctions should not target the people of Kurdistan,” he explained, but “racists Kurds” who called for the vote. He also said that tens of MPs are working on collecting signatures to remove the Iraqi President, Fuad Masum, a Kurd, from his position for failing to protect Iraq’s territorial integrity. Iraq’s Vice President Nouri al-Maliki, head of the ruling Shiite State of Law Coalition, rejected the US sponsored initiative that was presented by Masum.